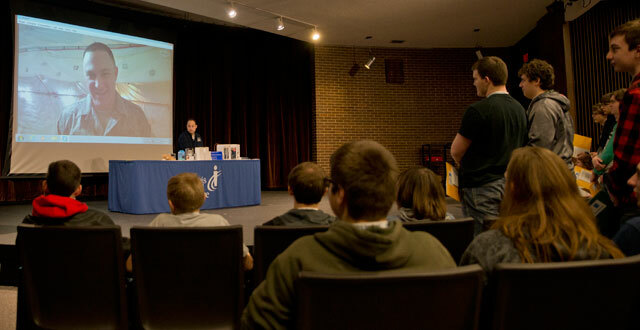 Pekin Community High School students at ICC’s CISCO: All-Academy Day were given a surprise chance to Skype with their teacher Eric McCann, Master Sergeant USANG — currently deployed overseas. Professor McCann, who teaches ICC Dual Credit Courses at the school, shared about the importance of managing computer networking and security in the military. A special thank you to Professor Eric McCann and his unit for their service to our country and investment in our students. ICC hosted students from Richwoods High School and Pekin Community High School for presentations from industry leaders and interactive competitions against other computer networking students at the 16th Annual CISCO All-Academy Day! Thank you to alumni Paul Welch with Pearl Technology and Andrew Fritz with Cisco Systems. The CISCO Computer Networking Program at ICC prepares students for careers in computer networking by earning professional CISCO certifications.